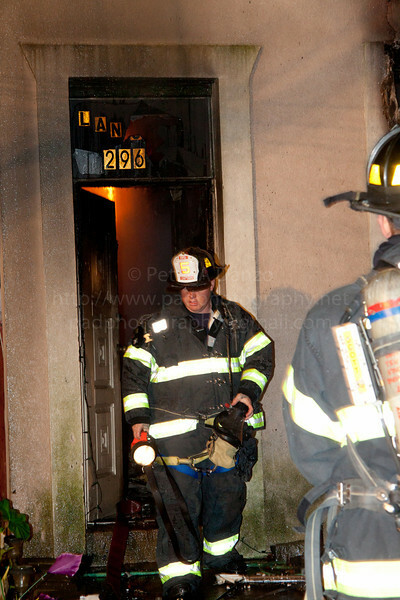 At around 23:30 hours both the Englewood and Teaneck Fire Depts, received call reporting a fire on Forest Ave in the area of Webster (the city line) on arrival of the Teaneck battalion chief he found the fire to be at 296 W. Forest Ave in Englewood and reported a working fire in a 2 story brick OMD with heavy fire on the 1st and 2nd floors and already through the roof, the building actually consisted of 5 attached units and the fire was on the B end of the building extending along the roof line into exposure D. All 1st alarm Teaneck and Englewood co's immediately went to work and a 3rd alarm was transmitted for Englewood bringing mutual aid to the scene from Hackensack, Tenefly, Bergenfield and Leonia. Due to the heavy fire conditions, co's were forced to make an exterior attack quickly knocking down the fire on the first floor but the fire 2nd floor and cockloft were still well involved compromising the roof and the stairs to the 2nd floor. After almost 60 minutes all heavy fire was knocked down the fire fire was PWH with extensive overhaul required. Co's remained on the scene through the night and the cause of the fire is under investigation.